Many people are surprised when they first learn that trade is only a small element of the World Trade Organization, but the WTO actually covers a huge array of subjects never before included in trade agreements. The new agreements that were born with the WTO almost nine years ago included 800-plus pages of rules that interfere with food safety standards, environmental laws, social service polices, intellectual property standards, government procurement rules, and more. 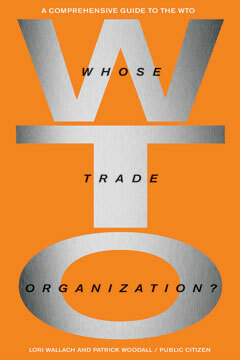 Whose Trade Organization? is the definitive guide to the reign of this undemocratic “trade” regime that has sparked protests from Seattle to Quebec to Genoa. With case-by-case studies, the book exposes the lopsided agreements and secret tribunals that are the tools of the WTO’s trade, and reveals the aggressive corporate agenda at its core. This myth-busting guide explains cutting-edge conflicts over rainforest destruction, genetically modified foods, sweatshops, lifesaving drugs, and many other global issues. And it offers critical and timely prescriptions for challenging the WTO and building a public-centered, democratic alternative. Patrick Woodall is the research director and senior policy advocate for Food & Water Watch.